Skateboard bearings are small pieces of metals that serve as an additional element added to the wheel of your skateboard. These bearings allow you to be able to mount your skateboard very well and confidently. Skateboard bearings are usually small and circular having a diameter of about 22mm, the width of 7mm and a bore of 8mm. The size of the skateboard bearings no matter the producer or designer is always the same as it is standardized equipment used by the lovers of skateboarding for having the best experience possible. Skateboard bearings usually come in different colors giving its users the very best chance to choose the color that suits them most, if you are a lover of skateboarding then you should consider getting one of the best skateboard bearings available. However, skateboard bearings vary based on their ability to move, and whenever you want to get a skateboard bearing, you should always check the ABEC (Annular Bearing Engineering Committee) ratings to know what you should expect when you purchase a set of bearings. The ABEC ratings include the ABEC 1, ABEC 3, ABEC 5, ABEC 9, ABEC 11 and higher ratings which you should check before making a purchase. As a guide, you should know that the higher the ABEC rating, the faster the speed of the skateboard bearing. The type of skateboard you get should be determined by what you want to use it for, skateboard bearings with ratings of 1 and 3 are recommendable for those that are just starting with skateboarding while higher scores from 5 to 9 are great for professional uses. SHIELD: The protection helps to prevent the penetration of dirt into the ball of the bearing. This is an integral part of a bearing as it determines the strength and capability of a bearing. BALL CAGE: This is also referred to as the “ball retainer” which helps to keep the balls apart, and it also helps in the regular radial spacing of the shots. This also serves as a reservoir for oil which aids the lubrication of the balls and aiding motion. BALL: This is regarded as the most critical portion of the bearing as it allows the movement of the casing around it. The ball could be made out of ceramic or steel. OUTER RING: The outer ring is responsible for the fitting of the parts of a bearing and other components. INNER RING: This is usually attached to the outer ring, and it helps in the fitting of the axle through. C-RING: This ring helps in the locking of the shields in the right places, and they are thin rings which fit into the groove found around the outer bearing. If you want to improve the quality of your skateboard bearing, however, other things can be added to bearings to make them perform better. These things are known as the Bearing spacers and Speed washers. However, there are different producers of skateboard bearings, and they have various models of their products. Here, we will bring to your knowledge of the top-rated skateboard bearings available out there, and you can get one of them whenever you plan on purchasing materials for skateboarding. The bearing spacers are metals that are designed to fit in between the balls of the skateboard bearings, and they are usually used by advanced skateboarders that have hard landings when skateboarding. So, the spacer helps to prevent the breakage for the balls by spreading the weight distribution across the surface of the bearing. The speed washers also help to reduce the friction of the bearings which helps to increase the speed of the skateboard bearing in total. The Bones bearing reds bearings are the best set of bearings available out there, they are not just the best most of their products are known for their ability to last a day overcome the test of time. This bearing product is made of eight bearings, and it has an additional sticker added to it, and this contains the instructions regarding how to set up the taking and use. One of the benefits of this product is that it is straightforward to clean and it produces less friction giving it the ability to create very high speed and this bearing are very easy to clean. These bearings have a removable, single and non-contact rubber shield which is always added to it. This product also contains a high-speed ball retainer which is made of nylon, and it is of high speed and strength. Apart from being very fast, the bearings are usually pre-lubricated by the producer with a cream racing lubricant which makes it very easy and convenient to use for all purpose. It is used by professionals and can also be used by those who want to experience skateboarding just like the professionals. Has eight reliable and robust and stable bearings. Has non-contact rubber shield that reduces friction when rolling and makes it easy to clean. It comes already pre-lubricated for use. Guarantees a very smooth ride. Has a nylon ball retainer integrated to provide a high level of speed as well as a strength. ​Lacks a groove at the inner race. 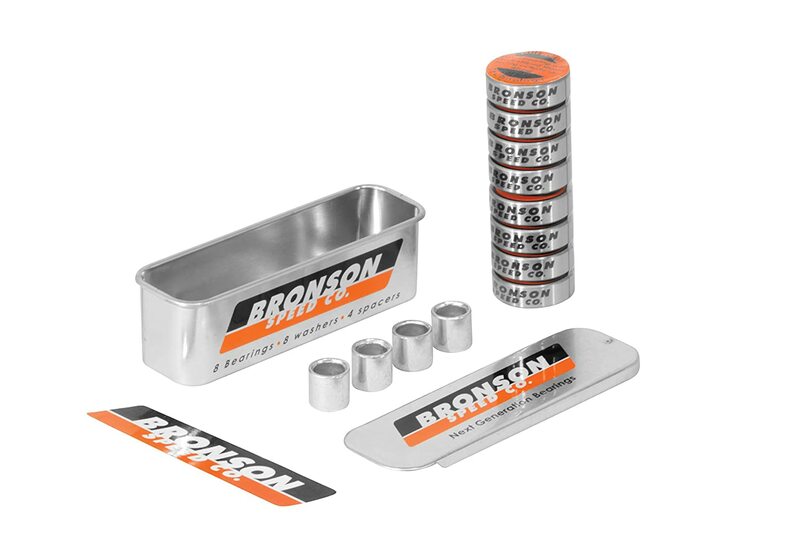 One of the newer breeds of skateboard bearings that you can also opt for is the Bronson G3 Bearing set. This modern bearing set is a professional grade ABEC 7 bearing which comes pre-lubricated to ensure longevity and smoothness in every ride. It comes with a standard size which guarantees a more efficient performance along with durability. It is also a popular choice among pro skaters because of its flexibility and adaptability to any wheeled devices and machines such as carts and skateboards. Also, despite its small size, it is guaranteed to carry heavy loads and weights without getting damaged. Compared to other options, this set of bearings also guarantees noise-free performance. The set comes with eight bearings, eight washers, and four spacers to provide you all you need for your set up. Since this specific brand of the bearing is designed with standard balls and components in its system, replacement parts and components are easy to find on the market. Also, its standard features make it an ideal choice for other ventures that require bearings. The yellow jacket premium skateboard bearings are very distinct and different in that they are of high quality and it is known for its ability to work at a very high speed with a significant level of precision. This bearing is also distinct because it can be used for so many board riding which includes using with longboards, roller blades, inline skates, and electric skateboards. 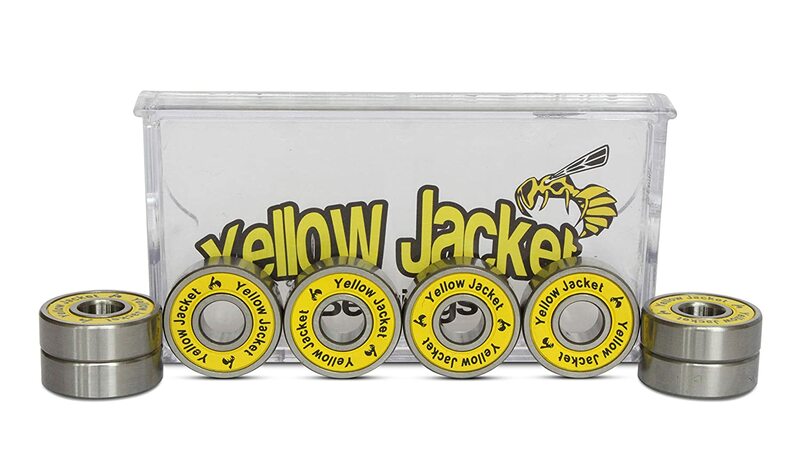 The yellow jacket skateboard bearings are very distinct, and they are fully protected with engraved color seals which makes it very attractive as well as protecting it from dust, rocks, and dirt which helps in giving the bearing a better life which extends for as long as possible and it is of a better and excellent precision. This product is very distinct, and it is of great benefit to those that want to have the best possible experience which makes moving very fast, swift and easy. This product is known for its ability to produce minimal friction with high speed; it is lubricated with the quick lube which also helps to prolong the useful life of this product. The most noticeable drawback of this bearing is that it produces a great deal of noise making it less attractive as compared to the earliest products above. If the sound generated by this bearings can be eradicated, it will be very high to use for individuals who want to use it for different activities and purposes. The Spitfire Burner Skateboard is a very classy and distinct type of bearing. It is known for its ability to produce very high precision and speed when in use making it on different the best bearings out there for skateboarding. If a product is ever going to suit you well and give you a better experience then the Spitfire is the best product in the market, they are known for their capability to fit well for skateboarding being the primary purpose for which this bearing are produced. The bearing is less costly, and it can also be used to improve your ride as it is resistant to impact due to the presence of the highly integrated and removable nylon cages. It is funny how a low-cost product can have super features that make skateboarding awesome and fun to do, this bearing is fire-resistant, and this is due to the high carbon chromium steel rings that it has. This product is well polished, and it has the capacity of lasting for a very long period. 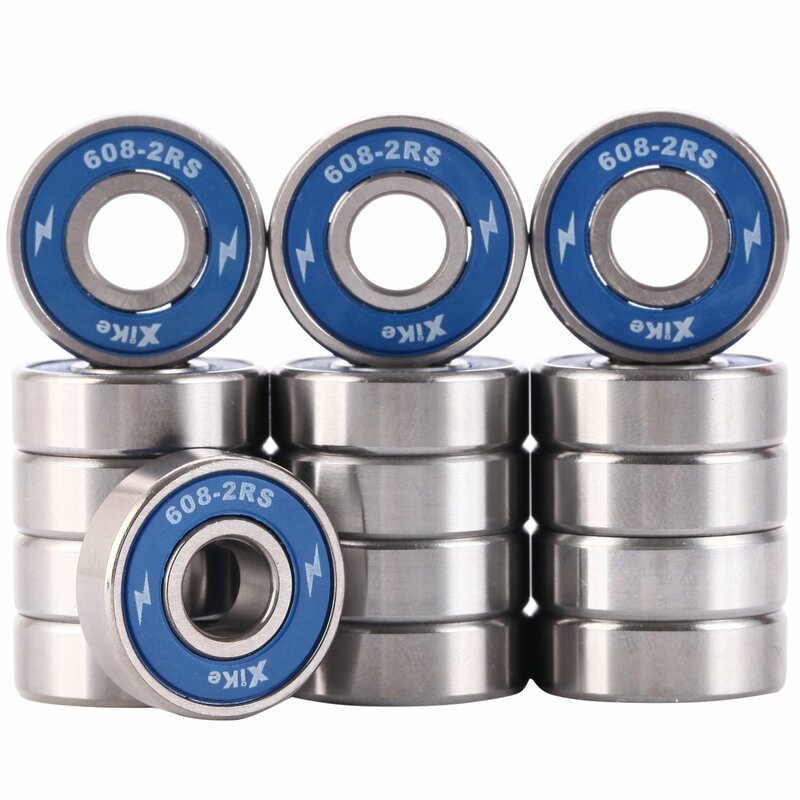 If you want more pieces of bearings out of just one package, the XiKe 16 Pack 608-2RS Skateboard Bearings are the great option for you. If there is one thing that XiKe products are known for, it would be its specific design in its particular field – which in this case is skateboarding. It comes specifically designed for the skateboarding sport and ensures reduced noise, smooth glides and strength. It is designed with materials and components that can withstand great friction, pressure, load and even corrosion. It also comes designed with a non-contact double seal to ensure dirt and any impurities do not contact the balls of the bearings. While this set of bearings is tough and robust against dirt, moist and impurities, it’s quite easy to disassemble for cleaning and maintenance. Also, compared to other bearing options, this particular brand does not require much oil or any lubrication solution – only a few drops can already provide you with the performance you need. This bearing set is also designed with a nylon cage to relieve stress on the bearing and also to reduce sound on performance. Now that you had a look at your best options of the best skateboard bearings in the market, we will show you what you need to look for before you wrap up your decision of purchasing your choice. Above all else, you will always want your skateboard bearings to be durable and can last for a long time. Before cashing in on that particular bearing set, you need to check out its durability. Can it withstand heavyweights, friction, and speed? Also, you need to make sure it does not rust right away else you’ll end up purchasing another set of bearings after just a few months. It would also be best to check out what your ideal skateboard bearings are made out of. Almost all bearings are made from different materials, and some of them are also made for different purposes. Additionally, each material can be used for other purposes which in this case you would want your bearings to be made exactly for skateboarding. Ideal skateboard should come pre-lubricated upon purchase. It ensures that the product is well-maintained through the lubrication even when stored in the stock room and can be used right away right off the box. Each bearing set will also come with a specific speed performance and capability. While bigger balls in the bearings provide durability and strength, it may have a lessened speed compared to the small balls in bearings. Nobody wants a loud noise coming from your bearing every time you roll. For reduced sound, it is best to opt for bearings with nylon or plastic cages. Not only does the cage trap the sound during the performance but also prevents and blocks dirt and moist from getting in. Whenever you want to purchase a bearing for skateboarding, you should always look out for the rating of such a bearing as this will help to know what you are buying. Also, you should always ask for the level of versatility of each product and what they made out of, either being ceramic, titanium or steel which makes it very easy to determine what you should expect. The above-listed products are skateboard bearings some of the best products available for use; they are made out of very friendly and excellent materials, that is, ceramics and steel with each of this material providing these bearings with its distinct capability. The bearings can, however, be made to last longer if it is appropriately managed and d took care of, it will be very detrimental if these bearings are not adequately maintained, as this will reduce the life of the bearing and it will as well make the product of less durability. 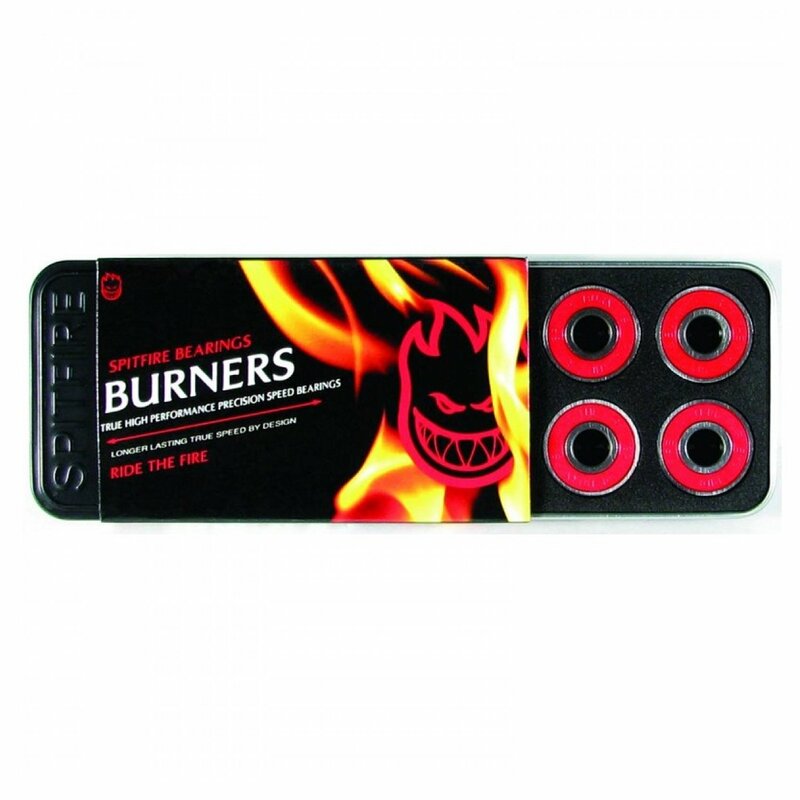 The Bones Bearings Red bearings ranking first among the bearings are great rings which are very easy to use, and they have super features which makes it very classy and the best among all. It is essential that you should always check for the presence of all the components of the bearings. Before purchasing bearings for use, still, make sure that the bearings contain all the necessary elements needed for its smooth functioning.